The menus are now available. Thanks to Brian Greenwood and the Sou’westers for liaising with the Hotel. If anyone wishes to change their choice of menu from A to B or vice versa then just drop me an email. Once your payment has been verified, all entrants will be listed on the site together with details of which event has been entered and whether or not a meal is required. Entries can be viewed by club or in name order. Should any of these details be incorrect, please contact me.. The routes for this year’s event are now available. All distances are listed in this download and each are accompanied by an outline map of the route. Should you decide you wish to change your distance, just let me know. You will notice that some of the routes overlap and they all share the same refreshment stop. The 2019 entry form and information about this year’s event is now available via the entry tab above. I look forward to receiving your entries. Let me know if you have any issues. By selecting the number of people you wish to pay for, you should be able to make a single payment for multiple entries (providing they are paying the same amount i.e. all having the meal, or all not having the meal). Happy Christmas to everyone! Details for the 2019 event are now coming together. Sou’westers have kindly offered to take over organisation of the Sunday evening meal from Alex. Thanks to Alex and Alan for all your help organising this over the last few years. Your support has been greatly appreciated. Work is underway on the 2019 Entry Form; a message will be posted on here and the Facebook group once it is available. Travel reservations are now available. This year there is not a fixed price for tickets, instead they are granting us a 20% discount on the public prices available at time of booking. I understand this will result in a price between £32 and £44 per person (with bike). To get the 20% discount you will need to call the group booking office on 0800 917 1201 and quote Product code T20CSTREET (this being Caroline Street’s Dieppe Raid Group). Please be aware that this 0800 number will transfer you to a french number so the dialling tone will sound different; you will also need to listen to a french message prior to being connected. English speaking assistants will be available to help you. Thanks to everyone who has sent me photos for inclusion on the website. Use the link above to view photos received so far. Let me know if I’ve missed any. The 2019 event will be held on the weekend of 29th/30th June. Generally the entry form is published on this site once I have confirmation of travel arrangements - often around the end of the year, though not until February this year! So, for now, just pop this date into your diary. If you are interested in handing out cards to help promote the event then that would be greatly appreciated. Just let me know how many you would like, and I can post them. I always find it useful to keep a few with me so they are available for any potential Raiders I bump into when out and about. If you have photos from previous Dieppe events that you would be happy for me to place on this site then just email them through to me. I realise I've already been sent a few and intend to publish them once I find time. Please print and read the Information Sheet and your route details. If you are new to Dieppe then you may also wish to print the Dieppe Town map. This year the list of entrants is ordered by your selected distance, club/group and name. PLEASE NOTE: The provisional seating plan given above does not include the following people who have only just registered for the Sunday meal following some late changes: A Kellaway, A Imeson, J Trewin and C Batch. Please be aware that Hotel Windsor may alter the table format. It is not intended that this plan will be updated as there is inadequate time for this to be feasible. Unfortunately Alex and Alan are no longer able to attend the meal but intend to be available to organise seating. The HQ for the ride on Sunday is near the Town Hall - refer to map for details. If you have any queries then please email me. Entries are now closed for the 2018 event. Details to follow shortly. They will be posted on here for you to print. All entrants will be emailed to let you know when they are available for download. Click here to access all the route details for this year’s event. It is recommended you print a copy of your selected route. A map of the area is also advised. Further details will be published on here once entries have closed on Wednesday. The menus are now available. Thanks again to Alex for all his hard work agreeing the menus with the Hotel. If anyone wishes to change their choice of menu from A to B or vice versa then just drop me an email. Sadly Alex and Alan have decided that they wish to hand over the organisation of the meal to someone else following this year’s event. They have done an excellent job for the last few years which has been greatly appreciated. Their assistance has been valuable in the selection of menus, liaison with Hotel Windsor, drawing up seating plans and taking overall responsibility for the smooth running of the evening. If you might be willing to help out in 2019 then this year’s meal would be a good opportunity to find out more. I am no longer taking bookings for the Sunday meal. You may still enter the cycling event and register your interest for the meal, if you wish, using the Additional Information box. Should anyone cancel, or more places become available, I will contact you to advise regarding payment. You will notice that the entry form and travel details are now available. However, we are in the midst of a family bereavement as I lost my mother on 2nd February. Naturally this is a very difficult time. Perhaps you can bear with me for a few weeks. You are welcome to enter the event but I am unlikely to verify your entries until nearer the end of February. 2nd January 2018 - Happy New Year! The late publication of the entry form and details for 2018 results from a delay with the group travel arrangements. The travel company who deal with bookings were unable to provide this before the new year but I'm hoping it will come through soon. They advised that there should be no issues with the Newhaven - Dieppe ferry but the office dealing with group reservations may alter. I will be publishing the entry form as soon as further information becomes available. Apologies for this. The 2018 event will be held on the weekend of 23rd/24th June. Generally the entry form is published on this site once I have confirmation of travel arrangements - often around the end of the year. So, for now, just pop this date into your diary. If you are interested in handing out cards to help promote the event then that would be greatly appreciated. Just let me know how many you would like, and I can post them. If you have photos from previous Dieppe events that you would be happy for me to place on this site then just email them through to me. This year the list of entrants is ordered by your selected distance and name. Thanks to Alex for suggesting we provide a ribbon for this year’s event and creating the design seen here. There will be ribbons for both the British and French participants & helpers. It may help you identify others and make new friends. The ribbon will also provide an original memento. Thanks to Tony for these few words about his father who is sadly no longer with us. This photo was taken with his daughters at a recent Dieppe Raid. Eric Ashford passed away on Tuesday 23rd May 2017 age 94 suffering from a progressive illness. Eric had been a regular participant in the Dieppe Run from 1987 until 2015. He had been a regular rider with the Souwesters Cycle Club and the Midweek Wayfarers group. He also made many cycle tours in France, Germany and Belgium. Those who knew him will remember his sense of humour, sometimes black, and for his gift for self-parody. He may not have been the best cycle mechanic but was an extremely gifted "bodger" and (almost) always managed to get back to base. 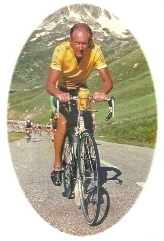 As a "bon viveur" he enjoyed being both on the bike, as well as the "apres bike" in a restaurant or bar (especially in Dieppe). During the war, he was in the RAF as a navigator in Lancaster bombers and was shot down near Troyes in northern France. He remained as a prisoner of war in Poland and Germany until the end of the war. 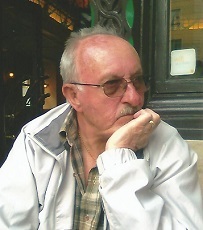 A quantity Surveyor by trade, he was also interested in European history for which he obtained a BA at the Open University after his retirement. He is survived by one son, two daughters and three grandchildren. He will be sorely missed. Please find below the translated routes for the Sunday event. 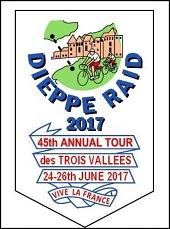 This year Dieppe CDC are additionally advising of a 50km route available at 2pm on Saturday afternoon. Unfortunately, those travelling over on the Saturday morning ferry are unlikely to arrive in time to participate. Apologies for not letting you know sooner but it appears that this was a last minute decision. There is no additional cost for the Saturday 50km ride and final details have yet to be confirmed. 9th April 2017 - Interested in Cycle Touring in Holland? I've recently been sent some information from a Dutch company (I met a friend of theirs when cycling in the Alps last summer). Their site can be viewed at Holland Cycle Tours. Further information available here. I have not used them myself but thought they sounded interesting. "Jock (Claud) Aldridge passed away peacefully on 1st Feb 2017 age 85, his wife Beryl died in 2011, they had 2 sons a daughter in law and 2 grand daughters who he loved. I’m sure he will be remembered as a kind, generous and thoughtful man also a frequent rider of the Dieppe Raid Tours. He was in the RAF for his national service and flew in Lancaster Bombers as a radio and radar operator and became a member of the RAF cycle racing team. He was always great fun to cycle with and can still remember him pulling me up some of those hills in France, he will be missed but not forgotten." Click here for some more pictures of Jock. Available from the photos link above. Happy New Year everyone!! The entry form and full details regarding group travel is now available from the entry page. Use the options above to access them. New photos are marked by New. You may have noticed a motorcyclist around the route this year taking photos of the participants. This was Andre Millet. He has very kindly posted me a CD with all the photos so that I can publish them on this site. They are all available via the photos option above or click here to access them. They provide an excellent record of the day including the route, people and camaraderie. If you have some of your own photos for me to publish then they would be greatly appreciated. They give prospective riders for next year a much better idea of the diversity of cyclists attending this event. Thanks in advance. Thanks to those who have sent me photos from this year's event. They can be viewed here or via the photos option above. More photos would be greatly appreciated. I understand that a CD of all the photos taken by Andre, the french gentleman on the motorbike, is currently winging its way to me via snail mail. I will aim to publish these too once they arrive. That is, if my hard drive can cope with all the data!! Thanks to everyone for your comments - review the Testimonials page for details. It's great to have so many positive comments. The weekend for next year's Dieppe Raid is 24th - 25th June 2017. I generally expect to be able to gain agreement for the group travel just before Christmas. Publication of the entry form occurs soon after. Some of the files posted on 3rd June have now been updated to incorporate changes, late bookings and other details. The only files that have altered are the provisional seating plan and the entrant list. Please print out copies of anything you may require as it is wasteful for me to print out additional copies. With regard to the 140k and 200k routes: there will be a second refreshments stop for you at Cuverville-sur-Yeres. If you have any queries then please email me. Please print and read the Information Sheet and your route details which include a map of your route. If you are new to Dieppe then you may also wish to print the Dieppe Town map. Route details for this year are now available. Click this link to view the route information. Please note that gpx files have not been provided this year though some riders may make them available via the Facebook page. The route details attached all include a map for each distance so print out your details and map so you can ensure you don't go astray. The routes are generally well marked on the road but they can be difficult to see if it's wet ... and sometimes there are markings on the road for other events. It is your responsibility to follow your chosen route. Group travel is now closed. Naturally you can still make your own travel arrangements with or without vehicles from any location according to your preference. Entries to the event will remain open until early June. The menus are now available. Apologies that they have taken so long but massive thanks to Alex for all his hard work agreeing the menus with the Hotel. If anyone wishes to change their choice of menu from A to B or vice versa then just drop me an email. Group travel information is now available so this can be booked from Monday 18th January. Remember that you can only book via telephone through the group booking office, there are restricted opening hours and you must quote "Dieppe Raid 2016". Full details are available via the entry option above. Group travel details should be available some time during week beginning 11th January. There will be options of 2 different sailings per day on both outward and return journeys. If you are organising a large group then early booking is recommended if you wish your group to travel together. Group travel details will become available once details have been agreed. It is unlikely that these will now be available until early in 2016. Apologies for the delay. The ferry company has yet to agree arrangements though they assure that there should be 2 sailings per day. A number of riders have requested access to the entry form for next year. This has now been published but we are unlikely to have group travel details until nearer Christmas. You are welcome to enter now using the entry page. If you prefer to wait then that is fine. The Dieppe Raid will be held on the weekend of 25th - 26th June next year. Although the date has been agreed for next year's event but we won't know the group travel arrangements until later this year. Once I have this information, I will publish the entry form. So .... watch this space!! It is anticipated that there will be more ferry crossings available for reservation for next year's event. Thanks to Lorraine Weedon amd Graham Edwards for providing me with some photos from this year's event. Follow the Photos link above to view them. Paul Fox organises the Friendship Ride every year and would be delighted to have more British riders along to accompany the Dieppe riders. The Friendship Ride will take place on Sunday 6th September with around 30 guest cyclists from Normandy and Picardie. Rides of 60km or 100km will be available around East Sussex starting from the South Downs Youth Hostel at Southease at 8.30 am. Enjoy a very leisurely day with ride leaders, lunch in the village hall and a prize giving reception at the end. Entry is £6. For additional information contact Paul Fox. The date will not be confirmed until early September - currently they hope it will be 26th June. Keep an eye out for confirmation of next year's date on here or Facebook. Thanks to everyone for making this year's event such a great success. Special thanks to Alex for organising the Sunday evening meal. The new arrangements of restricting the number of people requesting to be seated together seemed to work well by encouraging people to mingle. The publication of a provisional seating plan prior to the event also seemed to prove helpful. This year there were 422 entrants in total - 234 British (or organised through this site) and 188 French. There were 370 cyclists, 43 MTB riders and 9 walkers. It was great to have 2 riders from Evesham Wheelers as this was Neville Chanin's club. If you have any photos from this year's event that you would like me to publish on the photos page then just send them through. Please print and read the Information Sheet and check your entrant number. If you are new to Dieppe then you may also wish to print the Dieppe Town map. The list of entrants provides your unique reference number to help speed up the check-in for the cycle ride. Please make a note of your reference number even if you choose not to print this sheet. We lost another friend the other day, sadly Tony Noice, a Dieppe regular, until his recent illness, passed away after a short battle with cancer. Tony will probably be best remembered for his voracious appetite and his enormous thirst which he did well to satisfy on each and every occasion that presented itself. Tony was built like a pocket battleship, he was a phenomenal bike rider and would often cycle up the Dieppe hills in top gear, overtaking his lesser companions, whilst puffing away on one of his roll up cigarettes. Tony rode every day, he never bothered to pass his car test, even though he worked for Fords in Southampton, and he was a regular visitor to The Guide Dog pub where he would meet his many friends, before setting off to play or watch football or to go on yet another bike ride. He always enjoyed Dieppe and to those of us who knew him well we will always treasure his dry wit and sense of humour, he was after all the man who gave us Mickey Poodlesnips. Fond memories, may he rest in peace. Route details for this year are now available. Click this link to view the route information. Please note that the 60km route does not seem to have a lunch control. Dieppe have advised that food will be provided. Generally all the routes pass through the same lunch control but I imagine they may have changed it this year to add some variety for the 60km riders. Although you can no longer purchase the group booking option, you could travel via a different route, take a vehicle on the ferry or travel on a different date, if you wish. There are lots of options available. If the places I've reserved haven't been taken by this Friday then they will be lost. It is my understanding that they will not be freed up for cyclists to book as the company had to make special arrangements to allow so many cyclists on board. Thus, if you intend to book then you have just 2 days to get it sorted. Remember to follow the instructions on this page. Scroll down the page to find the Travel information. If you miss the group booking option then it may be possible to travel via another route or take a vehicle onto the ferry with your bike. The postal entry form is now available from the Entry page of this web site. On-line entries would be appreciated wherever possible to reduce effort. Anyone who has sent me an envelope will receive details over the next few days. They are now ready to post. Apologies for the delay. Happy New Year everyone! 18th December 2014 - Entries now available for 2015! Use the links above to access the entry form. Unfortunately we're still awaiting group ferry details for next year. I am assured they should be available soon. Once I have this information, I will publish the entry form. So .... watch this space!! This coming Sunday 7th September sees the 26th edition of "The Friendship Ride" when our French hosts of the Dieppe Raid cycle event and other French cycling colleagues come to ride the beautiful Sussex lanes around Lewes and Newhaven. There is a new twist this year as the closure of the Alfriston Youth Hostel means that the event now starts and finishes at at the South Downs hostel, Itford Farm, Beddingham near Southease. We have 2 new routes of 70km and 100km as a result and have 26 confirmed French cyclists coming to experience our hospitality. As usual the event leaves the hostel at 9.00 with the prize giving including tea and cakes back at the hostel from 16.00. If you want to experience a very social and relaxed ride around the inspiring Sussex lanes whilst furthering the Entente Cordiale then this is the ride for you.Entry fee is only �5. Please contact Paul Fox on 07889904192 for any further details. Next year's Dieppe Raid will be held on the weekend of 27th June. I will therefore be looking to organise group travel tickets for Saturday 27th June, returning on Monday 29th June or Wednesday 1st July. Keep a look out on this site for more information. Alternatively, join the Facebook group using the link above - you can then be notified as information becomes available. This year the format of the route details has meant that I have not been able to translate them. Basically, the instructions are very simple but the attached document gives all the route details and some brief translation tips for left, right, etc. It is recommended that you print the route sheet for your distance. The entrant list now includes all the late entries. Dieppe CDC have advised that the Saturday reception will be held at the Town Hall. The document published below has been updated to reflect this ... if you haven't printed it already. Please print and read the Information Sheet and list of entrants. If you are new to Dieppe then you may also wish to print the Dieppe Town map. PLEASE NOTE: the welcome reception will be held at 6pm this year to allow for participants travelling on the Saturday ferry. The list of entrants provides your unique reference number to help speed up the check-in for the cycle ride; it should also be used to check-in for the Sunday meal, if you have chosen to attend. Please make a note of your reference number even if you choose not to print this sheet. We have some very sad news: on Tuesday, May 20th, 2014 at 6pm, our cycling friend Yves Laignel left us after an illness which caused him much suffering and no chance of recovery. All his family, everyone in Dieppe CDC, his working colleagues, his friends, are in sadness following his sudden departure. Yves was a talented cyclist who completed numerous events, was awarded numerous certificates, climbed numerous cols and dedicated himself with a limitless passion to "the queen on two wheels"
Yves spoke excellent English and was pleased to give a humorous translation of our speeches at The Tour of the Three Valleys. On a personal note, he was a fellow traveller whom I appreciated and with whom I very often rode both in France and abroad. Currently, we have our memories and some photographs but it is very little and it is very hard. His last cycling event was the 25th Friendship Ride on September 7th and 8th, 2013. Group travel booking has now closed. There are lots of other travel options available so it's not too late to join us. At the beginning of September Paul Fox organised the annual Friendship Ride for our friends in Dieppe. Photos are now available from the photos page. Thanks go to Paul for orgainsing this event for the last 25 years. Thanks also to Jean-Claude for these great photos. The ferry bookings have now opened. You should telephone 0844 576 8845 to book. The group rate ticket office is open 9am - 5.30pm Monday to Friday but closed on Bank Holidays. DFDS Seaways have agreed the following travel options for the Newhaven / Dieppe group travel. Outbound: 150 places on Friday 27th June at 10am; 150 places on Saturday 28th June at 10am. Return: 150 places on Monday 30th June at 6pm; 30 places on Wednesday 2nd July at 6pm. Any return ticket combination will cost £46. The group ticket is available for cyclists travelling by bicycle or as a foot passenger on the Newhaven - Dieppe route. It does not affect anyone travelling via other routes, other days or by car. Group ticket bookings close on 30th April, or earlier, if all tickets have been allocated. You need to quote the reference "Dieppe Cycle Raid" to make the reservation. Next year's Dieppe Raid will be held on the weekend of 29th June. I will therefore be looking to organise group travel tickets for Saturday 28th June, returning on Monday 30th June or Wednesday 2nd July. Keep a look out on this site for more information. Alternatively, join the Facebook group using the link above - you can then be notified as information becomes available. Photos from Jean-Claude of Dieppe are now available on the photos page. They include photos of the main group arriving in Dieppe, the walkers participating in the event and the awards presentation. A brief list of some of the awards are also available here. We are still waiting for the dates for 2014. There are 2 routes available 60km and 100km and the start is from the Alfriston Youth Hostel Frog Firle at 9.00am. We have 28 French cyclists taking part who will be staying at the Hostel after travelling over on Saturday. There will be leaders for both routes with a breakfast stop and then lunch at Berwick village hall prepared by lady volunteers before returning to the Youth Hostel in the afternoon for tea cakes and a presentation of trophies. The entry fee is �5 per person which includes the tea and cakes at the end of the ride. Breakfast and lunch is pay for what you eat. The event is very social and relaxed with plenty of time to soak up the views and practice your French. If you are intending to come it would be very helpful to know the numbers particularly for the catering. I hope those of you who joined us this year all arrived home safely. We were 282 riders in total and outnumbered the french cyclists by just 2 riders ... not that it's a competition! Thanks to everyone who successfully encouraged more riders to join us this year and Shirley Pougher who joined the walking group. It really was an excellent turnout. I intend to email everyone who attended this year to request any photos ... and talk about a few other things. In the meantime, I have written to Dieppe to confirm the date for 2014. They did give us a provisional date at the Saturday reception but I need to check that it is not just a provisional date before I publish it. Please keep a check on this site. There is now a new "testimonials" option at the top of the page. Thank you for all your kind comments ... it makes it all worthwhile and hopefully will attract more riders next year. If anyone has any photos they can send me for the photos page then perhaps you could email me and I will give you access to my shared Dropbox folder. Alternatively, if you have just a few (up to 15), you could email them to me via the email address on the contacts page. For anyone who uses Facebook and has an interest in being notified about next year's plans, you may wish to join our Facebook group - see the link above. When we get the confirmed date or any other important information, it will be published on Facebook. You may find this easier than checking this site. The choice is yours. The Dieppetour.com site will contain more information but I cannot always update it straight away. The on-line entry form is now available. You may have seen our recent advert in "Cycle" on page 68. Further advertising is planned. Access the entry form. The date for next year is now available. It will be on the weekend of 30th June. More details will be published as they become available. More photos available - 2 new sections and some more pictures in the 2002 section. If you want to send me photos using dropbox then just let me know. Dieppe CDC intend to pass me the dates for next year's event once it has been confirmed at the beginning of September. Just to say that I thoroughly enjoyed this year's Dieppe Raid as much as the previous year, despite Sunday's bad weather. Last year just two of us came, but this year there were six of us, and we had a great time. So heartfelt thanks for all the organisation, and to the French colleagues as well. It is now a permanent fixture in our diary. Good tour - sight-seeing and pedalling! Just a quick note of belated thanks for this years weekend. All our wheelers loved it [maybe not the rain on Sunday].You have a unique event and i'm sure a few mentions on the sportive calendars would bring in a whole new generation of riders. Sorry i didnt get the chance for a chat but i know big Nige did get to see you after the presentations,i was trying to hold off the onset of hypothermia. As first time participants this year, we wanted to thank you and your colleagues for organising last weekend's cycling in Dieppe. Despite the wind and rain on Sunday! we enjoyed our trip and know it will have taken up a lot of your time and hard work to ensure its success. We did have a pleasant sunny ride on the Avenue Verte on Monday and completed 50 kms (which is a lot for us). Our friends who came with us for the first time also enjoyed themselves. Your efforts on our behalf are much appreciated. Many thanks for organising another great weekend in Dieppe. You have obviously got the formula right judging by the number of people who come back year on year. It is only our second one and the Naviguessors will certainly be back next year. One of the shorter rides for some of them I suspect due to creaky bones! Thanks again for organising the Dieppe Trip. Despite the dreich weather on Sunday we finished the 100km route which was a new route to me through nice countryside. We did the reverse route in glorious weather on Monday before the ferry trip home. Hi Caroline, many thanks for another great event, the weather didn't really mar the event and we still really enjoyed it, as you know we are used to the rain in the UK. Already planing for next year. Hi Caroline, many thanks once again for a great event. I have put together a website of the Souwesters photos etc which you are welcome to link to, it also contains our Gite tour covering the next week. There is a now a link at the top of the Dieppe page to a new photo gallery. You are invited to email me photos for inclusion on this page. Please be selective and send me just your best shots. A few words about each photo would be great. The weather may hav been diabolical for the Sunday ride but spirits were high amongst the cyclists who braved the weather and enjoyed a wonderful day's cycling in the countryside around Dieppe. A record number of people requested I contact Dieppe Cycling Club to congratulate them on the wonderful routes. Luckily Saturday and Monday were fine. On the Saturday 12 british riders set out on a 60k ride - this was an additional event offered because of the club celebrating the 40th anniversary of this event. Good weather on the Monday allowed many cyclists to revisit the routes they'd ridden the day before. As usual, the Souwesters club and Bedwell Wheelers took many of the awards but this year there was a large contingent from Fareham Wheelers who walked away with 3 awards, including the award for the youngest rider from the UK. Unusually there were no children with us this year so the youngest rider was, in fact 21. It would be great if we could attract more triathlon and sportif competitors. This event is much cheaper, far more fun and presents a good introduction to cycling in France. Racing cyclists and tourists alike can all benefit from CDC Dieppe's organisation. The following entries have been received. Please check that your details are correct and advise me of any changes that may be necessary. Click here to view. Please note that all late entries are now included in this list but changes to team names have not been corrected. I can confirm that CDC Dieppe have been advised of the changes. The late entries received to date are now included in the entrant list below, existing reference numbers remain unaltered. Please print and read the Information Sheet, list of entrants and your selected route sheet. If you are new to Dieppe then you may also wish to print the map. The list of entrants provides your unique reference number to help speed up the check-in for the cycle ride; it should also be used to check-in for the Sunday meal, if you have chosen to attend. Please make a note of your reference number even if you choose not to print this sheet. If you have booked for the Sunday evening meal and wish to be seated as part of a group, please email me with a list of all the people in your group. It is important that you check with them first to ensure that the number of people in the group does not alter at the last minute. Click here to view details of Neville's cross-country records. More details about Neville's running background are available via the " Neville Chanin" link above. Thanks go to Chris Harvey and South London Harriers for permitting us to publish this article from their magazine. I have had an enquiry from a male cyclist who wishes to share a room with someone. He has reserved a room but really wants to reduce costs. If any male is looking for a room share then please email me and I will put you in touch with each other. The group travel bookings have now closed. Don't despair though - other travel options are still available but you need to check with the ferry companies. If anyone is looking to share accommodation but doesn't have anyone to share with, let me know and I will put you in touch with each other. Please provide either an email address or telephone number that you are happy for me to pass on. Hopefully this will help reduce the expense. I am looking to add interesting photos and details to this new page on the site. If you have anything you think may be suitable then please get in touch with me. Please be selective when sending me photos - I use my email address for work so it is important it doesn't get blocked up with very large files. Thanks. This year's Friendship Ride will be on Sunday 9th September. The Dieppe cyclists will be based at Alfriston Youth Hostel. As usual, the event will be organised by Paul Fox. If anyone is able to come along to join the cycle rides then you would be most welcome. If anyone is available to help organise some routes then that would also be greatly appreciated. Paul needs a variety of routes to match all abilities. Just contact me and I will forward any messages to Paul. I am sorry to report the sad death of Jean Stevens. 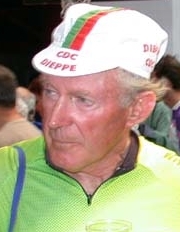 Jean had been a supporter of the Dieppe Raid (Tour des Trois Vallees) for many years and will be known to many of you. Our thoughts are with her family. 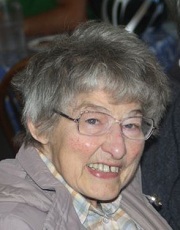 This picture shows Jean at the end of the Friendship Ride in Alfriston Youth Hostel in September 2011. Click here for some more pictures of Jean. Cyclists will need to check in 1.5 hours before departure to allow time for loading. Somewhat belatedly I am sad to report the sudden death of Pete Mitchell last September. Pete, a member of the Kingston Phoenix Road Club, had been a regular cyclist at the Dieppe Raid for many years. Scores of cyclists formed a guard of honour for the funeral procession of this popular cyclist. More than 120 people from local clubs turned out to honour Pete by escorting him to his cremation in Leatherhead. 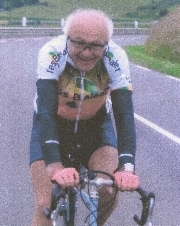 Pete covered a staggering 570,000 miles during 62 years of cycling. The Entry Form for 2012 is now available on the entry form page. Please note that this year there will also be a 30km and 50k ride on the Saturday afternoon. If you wish to do one of the Saturday rides you may prefer to travel on a different crossing rather than use the group booking. You need to enter the Saturday rides on the day as I am not taking bookings for it through this site. It's the first time the Dieppe club have offered this so I only have a few details. All the information I have available is on the entry form page - see link above. Please be aware of the new link at the top of each page. It provides more information about Neville. I published it a few weeks ago but forgot to make a note of it on this page. oops! ... just to say thank you for organising this event which my colleague and I thoroughly enjoyed. This year was my second Dieppe Tour and I'm already looking forward to the 2012 event. Thank you for all your hard work and organisation on this side of the channel. It really is a very enjoyable and worthwhile event. 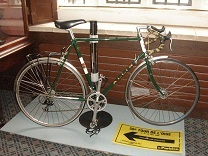 The recent Cycle magazine reported that there is a small exhibition of some of Neville's memorabilia at the museum in Stroud, Glos. Glen and I went along to view the exhibits last Saturday. They brought back a few memories!! Dieppe CDC have advised that the event will be held on the weekend of 23rd / 24th June next year. Book the date in your diaries now to avoid disappointment. We rarely know this far in advance. The other good news is that it won't clash with Le Mans so the ferry company should be happy too. This was my first Dieppe Raid, what a lovely event in such pleasent surroundings, I will most certainly be back. Many thanks for organising this classic. A note of thanks for your hard work in making the annual visit to Dieppe such a success. See you next year. Just a quick note to say many thanks for organising the weekend. All your work was much appreciated. Already looking forward to the next one. We have all vowed to get an earlier night next year (4am was a bit late!) and, maybe, try one of the longer rides. Thanks so much for a great weekend - we loved it and already talking about doing the 140km next year. Thanks so much for organising such a great event - I can only begin to imagine how much work it was and you should be congratulated on a brilliant weekend. I just wanted to say thank you for a wonderful weekend, and all the hard work that obviously went into it. All the people I met (including my own group the Wayfarers) had a great time and many of us used it as a spur for a longer trip which was equally enjoyable. 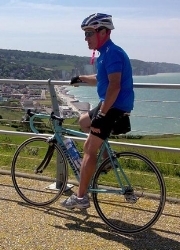 It was my first time on the Raid and I was very impressed by the contributions of both Brits and French (not to mention the great cycling countryside near Dieppe). Thank you for your contribution to organising it, and if you will please pass on our thanks to the CDC members and other French contributors, as well as the others on this side of the channel who helped make it such a success. I am now looking forward eagerly to next year's event! Thanks for organizing another successful weekend which in the main avoided the downpours in the UK. Thank you for your contribution to another well organised event and I am sorry that the presentation was marred by the PA system over which you obviously had no control. 29th June 2011 - Event 11th - 13th June 2011 - 40th Anniversary! The 40th anniversary of this event proved to be another successful weekend. Numbers continue to be down but the weak pound is a contributing factor to this. Of the 155 entrants this year, 39 had not attended the event before and many of these had never previously visited France by bicycle. Reports back from everyone so far have been good. The weather was kind to us - just a few drops of rain threatening the rides during the afternoon, but they never came to anything. At the awards presentations we picked up a number of trophies, as usual. A representative of the Mayor advised that they have been working with Transmanche Ferries to try to secure a better travel rate for us for next year's event. This would be really good but we must wait and see. Thank you to everyone for coming along and enjoying the weekend. Special thanks go to John Poulter for undertaking the translations of the French speeches for us and our french friends at Dieppe Cycling Club. Also heart felt thanks to Michael and Mo Bedford for once again taking on the organisation of the Sunday evening meal. All the reports indicated that you had a really excellent meal. Also, thanks to Ann and Bernard Daws for assisting at the meal by checking people in. I have just been advised by the Mayor's office in Dieppe that Transmanche are now allowing travel bookings to be made for the usual Saturday morning ferry. Please let me know if you experience any difficulties and I'll see what I can do. Apologies that this information seems to keep changing. As mentioned before, travel bookings on this ferry must be made before 25th March. I understand that 39 of the 80 places have been booked to date. I have been sent an email from Hotel les Galets in Dieppe with accommodation details. They are offering a reduction for groups over 20 people but their prices look quite competitive. I have not stayed there so including their information should not be taken as a recommendation. The Hotel is situated about 50m from the beach in the town centre. There are secure facilities for the cycles. Please contact them direct if you wish to book. They have requested reservations be made by 7th March. A date for your diaries. This year the Friendship Ride will be held on the weekend of 10 - 11th September. The Entry Form for 2011 is now available on the entry form page. This year it has not been possible to secure group ferry tickets so it will be necessary for everyone to make their own bookings direct with the ferry companies. Normally there is a restriction on the number of cyclists able to travel on each ferry with Transmanche Ferries (Newhaven - Dieppe route); we have managed to arrange for this to be increased to 90 cyclists on the Saturday morning (11th June) and for 80 cyclists returning on 13th June (the remaining 10 places are reserved for cyclists who may require a 5-day ticket). They have requested that bookings be made between 7th March and 25th March. If you are travelling on another route then you can book your travel as soon as you wish. However, please adhere to the 25th March deadline on the Newhaven route as otherwise it is unlikely that you will be able to book. Please bear this in mind when making your arrangements. Also be aware that there is no fixed price for these tickets (unlike the old group tickets) so check the price carefully before making your reservation. Click here to access the Transmanche Ferry booking screen. Naturally some of you may opt to travel from another port and then make your way to Dieppe by car or cycle. As we no longer need to travel on the group ticket, Glen and I intend to travel from Portsmouth to Le Havre and then cycle to Dieppe. The Information sheet we issue will provide full details of the arrangements for the weekend. Click here to access the LD Lines booking screen. Cyclists without access to the internet should either contact Transmanche by telephone or visit their offices in Newhaven to arrange ticket purchase. If you experience difficulties booking travel then I would be interested to know. If it appears that Transmanche are not honouring their agreement to carry 90 cycling passengers on the Saturday morning then I may need to follow it up with Dieppe. Similarly if the prices sound very high then please contact me. At current costs I would anticipate the fare being in the region of £35-40. I can confirm that the Dieppe Raid will be held on Sunday 12th June 2011. Are you free on Sunday 5th September and ready for a fun day out? Come and join the Entente Cordiale when Cyclists from 4 French clubs come to ride the beautiful Sussex lanes in the Friendship 2010 event organized by the East Sussex D.A. and the 21st Century Airports Cycling Team. The French are making a full weekend of it but the official event over 60 or 100km starts from the Alfriston Youth Hostel at 9.00am on Sunday returning there for tea, cakes and prize giving at around 4.30 pm. Always a very sociable and fun day out, please come along and keep our French colleagues company. If you want to meet the French for lunch and a ride out on Saturday that can also be arranged so for all information please email . Just a short note of thanks for organising yet another wonderful weekend in Dieppe. Our French hosts were as welcoming as usual and I look forward to next year. A great weekend on the "raid" and thanks again for your organising this annual event. I would like to take this opportunity to thank you, Michael and Mo for all your hard work in organising this event. The arrangements for Saturday and Sunday worked flawlessly, and the meal at the Windsor on Sunday was excellent, as was the company of course. It was the first time that my sons and I have participated in the Raid and we all agreed that we had had a fantastic weekend. We are all looking forward to the next Raid in 2011. Tony Ashford - furthest travelled rider, visiting from the USA. Ruth & Rob Maskell - winners of the MTB, 1st Tombola prize. Team award - won for team with largest mileage covered / largest entry of the event. This was my first time on the Dieppe Raid and I enjoyed myself so much that I just had to write to thank you for organising the event for the English cyclists. I was cycling with Dave Hoben, who I believe has been on around 18 Dieppe Raids, so you will probably know him. I am sorry that I did not get to meet you but you did seem to be quite busy, with so many English and French people to talk to. Dave had organised some sorties into the local countryside, in between the various receptions/events, so that took up quite a lot of time also. I am already looking forward to next years Dieppe Raid and so perhaps I shall get to meet you then to say THANK YOU face to face. Bill Collins' email to me after the Dieppe Raid described himself and his friends as being completely "cream crackered" following their exertions in France. He wrote: "...the ride went surprisingly smoothly for the first 50k until of course Sod's Law cut in when 2 young girls decided it was time to cross in front of us on their bicyclettes. Taking appropriate evasive action I shot, thankfully onto the grass verge at around 20mph landing arse over elbow, leaving a few minor cuts on my legs and the neat imprint in colourful bruise on my rear end due to my crashing backside first onto my mobile, but, and this is the important thing, without any serious damage to mon bicyclette, as my son, Toby, was keen to point out...###!!!". Bill decided to ride for Parkinson's UK because of the tremendous good that these small amounts of money can do when used collectively, not only for those who suffer but also to give a little relief for the carers, the unsung heroes and heroines who battle stoically against tremendous odds and, quite simply, because Bill was diagnosed with early onset PD 3 years ago. He is fighting it in the only way he knows how. He has done really well by raising in excess of £2,500. Congratulations on a magnificent effort. If you would like to support this cause, please visit his JustGiving page. August 1995 The 39th Dieppe Raid was very successful despite the absence of Neville for the 1st time ever. Dieppe Cycling Club paid tribute to Neville with photos and a speech that outlined his extraordinary character and the hard work he undertook to make this event what it is today. They also told of his numerous international cycling trips. The weather was kind to us and the routes really pretty. Everyone seems to have reported back that they had a good time. Many new attendees have already indicated that they'll be back next year. Events like this are always dependent upon getting new people along so over the next few months, please let people know what a great event this is. Not that I'm biased, of course. I intend to try to keep the news page updated with information that you send in. If you have photos or news items related to Dieppe then please email them to me and I'll do my best. I have setup a group on Facebook so you may be interested in joining it - so far it's not been advertised but it could be a good way of sharing information. Perhaps you would like to join the group? Just search for "Dieppe Raid". Following Neville's recent death, I sent a small donation to his selected charity (British Heart Foundation) on behalf of all the regulars at Dieppe. Eunice, Neville's sister, requested I display the following letter for all "Dieppe Raiders". I thought it best to publish it on the web site so that it is more accessible. Please click here to view the letter. Eunice's letter refers to a Dieppe Raid when the ferry was not running - I believe that this was because of a strike. As she correctly says, Neville managed to persuade the ferry company to leave Newhaven with the bikes and cyclists; it is my understanding that no other passengers were allowed to board. Without Neville's charisma, it is certain that the attempt to visit Dieppe that day would have failed. As many of you are already aware, I recently undertook a challenge to run 7 tough off-road marathons in 7 months. Yesterday I successfully completed the whole series. Thank you so much for all your support and kind donations. Several of you have mentioned that you'd like to know when they have been completed so you can ensure I suffer enough before pledging contributions. Thus, the links for the on-line donations are as follows: Breast Cancer Campaign and The Rainbow Centre, a local charity that helps children (and their families) with cerebral palsy throughout the South of England. Thanks to everyone who has supported me so far. It is greatly appreciated by both myself and the charities. I am devastated to report to you the death of Neville Chanin. 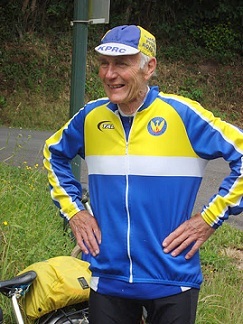 Neville died in his sleep following his return from a cycling trip in France where he and Chris Davies had been supporting the annual Paris - Camembert race. He will be a great loss to the cycling community, his family, and friends throughout the world. Our thoughts are with his sister, Eunice, and family at this sad time. Neville's funeral was held at Gloucester Crematorium on Friday 30th April. There was a large gathering - as would be expected for such a popular and well known member of the cycling community. A representative from Dieppe cycle touring club was also in attendance. Donations in memory of Neville will benefit the British Heart Foundation. Cheques payable to the British Heart Foundation should be sent to Richard Steel & Partners, Alderman House, 12-14 City Road, Winchester SO23 8SD. Neville instigated the first Dieppe Raid in the summer of 1972 and organised it for the next 22 years. It has continued annually ever year since and Neville participated in every event. The group ferry bookings have now closed. Entry is still possible but you would need to make your own travel arrangements. As many of you are aware, I am currently undertaking a challenge to raise money for 2 charities that I have a personal interest in. My challenge is to run 7 tough off-road marathons in 7 months. So far we have complete 4 of the 7. The last is in May. I am raising money for the Breast Cancer Campaign and The Rainbow Centre, a local charity that helps children (and their families) with cerebral palsy throughout the South of England. If you can offer any support, no matter how small, then that would be great. I'd like to say a big thank you to everyone who has already contributed. Entries can now be accepted over the Internet using PayPal to secure your credit card payment. Refer to entry & travel page for full details. I can confirm that the Dieppe Raid will be held on 13th June 2010. The group ferry tickets have been reserved: 3-day ticket for up to 150 people leaving on Saturday 12th and returning on Monday 14th; 5-day ticket for up to 20 people leaving on Saturday 12th and returning on Wednesday 16th. Once we have finalised the price of the Sunday evening meal I will complete the entry & travel forms and email through the link to everyone who attended last year and new people who have already expressed an interest. Alternatively, keep a check on this page to see when the on-line entry is available. A few people have asked me about the permanent cycle ride that is being organised by Dieppe CDC. A "permanent" is a planned route that can be completed at any time. All arrangements are made by the competitor. Click here to download and save the files. They are in zipped format. Comments about this year's event are welcome. Click here to review comments so far. It is with great sadness that I report the recent death of Sylvia. She had been cycling near to Grenoble when involved in an accident. Sylvia had intended to attend Dieppe this summer but sadly this was not to be. Our thoughts are with her family and friends. 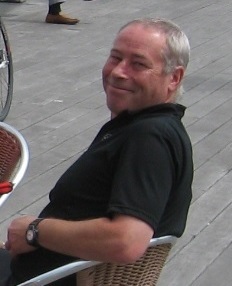 I am sorry to report that Alan Gray died on Sunday 17th April while on tour in Mallorca. Alan also attended the Dieppe Raid for many years. Sadly Keith Wawman recently passed away. He had been a regular on the Dieppe Raid for many years and will be sadly missed. According to Paul Coan, he was a member of CTC Croydon since at least 1975 (that's when Paul joined). 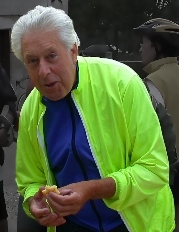 He was an active organiser of trips, meals & audax type events. In his younger days he raced for Addiscombe CC and has remained a member ever since. To those who knew him he was always the eternal optimist, ready for a laugh and let all of life's problems wash over him. This picture shows Keith enjoying a ride in Rouen. To date 98 people have booked so there is still space. Booking will stay open until 7th April. The outbound ferry on Saturday 13th June has been changed to 09.30 am so check-in will start at 07.30 am. The walkers will be completing a walk of approx. 15 km. Walkers should wear appropriate footwear - preferably walking shoes or boots. Take a small backpack as you will be given food and drink at the start which you must carry. Ensure you have clothing suitable for the conditions.